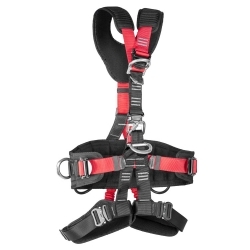 Harness for works on rope. Cushioned leg loops and shoulder straps for high comfort of work. Belt and loops for work positioning. Many possibilities of adjustment. Quick-acting buckles on leg loops for easy donning of the harness. Attachment elements for installation of a chest ascender.